Our Fence Boom can be used for both emergency response and permanent deployment in a variety of applications. Constructed from PVC encapsulated, closed cell foam floats, the Fence Boom is resistant to acids, alkalis, solvents and hydrocarbons. Fence boom does what all other containment boom does it just does more of it, with bigger and stronger materials and design. The fence boom is often used as a permanent barrier made with super tough materials for long term service. 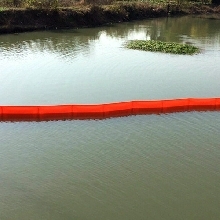 Floating Oil Containment Fence Booms are often used, when there is a need for a long term containment solution for oil or debris on water in calm water situations. 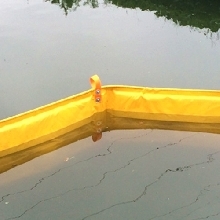 They are light weight and an easily managed containment barrier that is ideal for operations in coastal ports and harbours and inland waterways.